Following my recent blog post on driving test waiting times, I wanted to tell you more about what we’re doing to improve how we train and recruit new driving examiners. Over the last 3 years, test demand has increased by over 200,000 tests – with an extra 92,000 last year alone. At the start of the year there were 265 fewer driving examiners than the last time demand was this high. Between April 2008 and March 2009 we saw demand rise to 1,756,522. To help us reduce waiting times, we need to take on more driving examiners. Our recent examiner recruitment campaigns are starting to show results. At the start of the campaign we were recruiting on average 10 examiners per month (April 2014 to March 2015). Since April 2016, we've been recruiting on average 20 per month. However, the sooner new examiners can start testing, the greater impact they’ll have on waiting times. In the past, our recruitment campaigns brought in an average of 100 new driving examiners per year. We had to carry out 400 assessments to get those 100 examiners. These one-day assessments were made up of a role-play assessment and an assessed car drive. All candidates had to do both parts. We've now changed this, so instead of having a one-day event with 2 parts, candidates are now invited to a role-play assessment, where around 600 role-play assessments are carried out. Around half are successful, and they’re then asked to do an assessment drive. This lets us invest more time in driver development. While driving ability is still vital (we haven’t ‘watered down’ what we expect), we now give more time to make good drivers, great drivers. 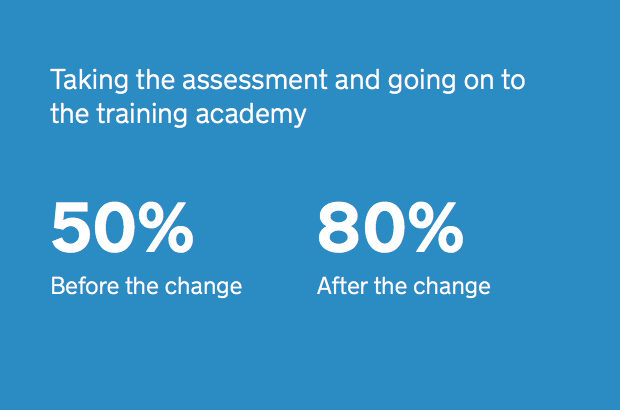 In the past, around 50% of those taking assessment drives went on to the training academy. This has now risen to 80%. Previously, anyone considered by an assessor to need more than 10 hours of driver development would have failed the test. Now, new entrant examiners get a 3-day driver development course so that all new examiners show a high level of driver competency. There are also 2 more days of driver development available for anyone who needs more time. The other big change we've made is to the training process. Many qualified driving examiners were already acting as mentors to new entrant examiners – giving up their own time through lunch and at the end of the day because they knew they were making a difference. We wanted to build on this dedication and recognise their expertise. This new process gives qualified driving examiners time away from testing to help prepare new entrant examiners for their course. This scheme has been really beneficial to driving examiners, new entrant examiners and trainers. It means that trainers can focus their specialist training skills on teaching the central competencies of examiner control and assessment. New examiners are based at their local test centre in weeks 1 and 2 to provide them with the opportunity to become familiar with the environment in their driving test centre. It allows them to learn the routes, accompany driving tests, and gives them time to reflect on the course so far. I'm aware that some instructors are concerned about new entrants accompanying driving tests during weeks 1 and 2. The more experience new entrants gain by accompanying driving tests and learning the routes, the sooner they’ll be ready to start testing. However, the examiner will always check that the candidates and instructor are happy with the new entrant accompanying the test. By working together we can get new examiners into test centres sooner. The earlier they start testing the greater impact they’ll have on waiting times. More driving examiners are still needed. I'm hoping to bring a significant number of new entrant examiners into the agency over the next few months. Sign for alerts when we advertise driving examiner vacancies by email, Twitter or Facebook. Looking forward to THAT email offering me a place for role play stage. 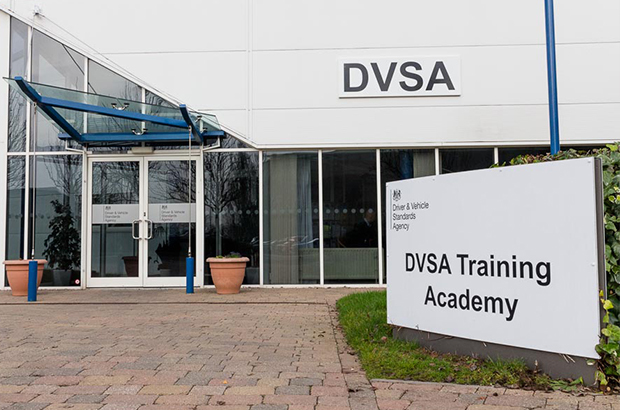 Could not the DVSA utilise the examiners time, when such test slots become available, by offering on a first come first served basis, the chance to take a test that would otherwise be lost to anyone turning up at the Test Centre who has had their documents and eyesight checked at the start of the day? We're promoting the 2,400 test appointments that go un-booked each month on Twitter and we've recently started to do the same with the short-notice car test appointments to try and them. Candidates will still need to book them using the online booking service on GOV.UK. Thanks for the update, look forward to seeing the finished product and test waiting times kept down to 5 weeks or less. Looking forward to the test waiting times coming back to normal, it's so difficult trying to forecast when someone will be ready with an 18 week wait. However, I hope new the examiners aren't going to be trained by some of the present examiners at my local test centre or they will be just as rude and unpleasant. full time examiners don't even know the answers to this sjt test and some explain that all the answers are not always relevant, and not the way that the DVSA actually operates.. perhaps this recruitment test should be re-thought out as i am sure there are many people like me who are a little disheartened at it being refused at the first hurdle. Kevin Higgins 30 years as a LGV / PCV instructor.. I have also failed this test on more than one occasion and I am very put off from applying further. In light of your comments regarding current examiners views on the SJT, I think it should be ditched altogether. If DVSA a suffering from a shortage of examiners then it seems obvious that some perfectly good candidates are slipping through the net. From the expatriated Brit in America's comments, it is clear that more work needs to be done highlighting those with good customer service skills as suitable candidates, through some sort of sift. It seems that DVSA could potentially be missing out on some very worthwhile examiners because of this subjective test. Yes I also did go for the LGV examiner recruitment process & I found the role play situations to be very vague & lacked any real life "meat on the bone" situations. I was unable to proceed on any further or able to, until now, give any feedback about the above process. Disappointed, yes!!! I am aware of your Twitter alerts, but I suspect many hundreds of test slots become available for the reasons I listed every month and I know many would be prepared to wait all day for the possibility of a driving test. Surely this must be a better utilisation of examiners time, could you please tell me on average how many tests are currently lost in the manner I have described. I would like to take part in a role play for the examiner position or book a test to see if I'm capable to reach the high standards , I would like to undertake the specialised training to reach my goals. What would I need to do to apply for this vacancy? We are not currently recruiting driving examiners. You can register for job vacancy email alerts. I would love the opportunity to apply to become an examiner, but have never seen any campaign. I don't understand why when recruiting new examiners they first have to do a SJT. What is the relivence? I am a driving instructor of almost 28 years and recently applied to be an examiner but was declined due to not passing this test. Surely with the experience I have I would be a good candidate to be an examiner. We use the situational judgement test to assess whether applicants are examiner material by assessing their ability to rate different courses of actions against several work-based scenarios. We welcome and encourage applications from a variety of backgrounds, so applicants don’t need to have any specialist knowledge to be able to complete it. That's great news Abigail (DVSA), hopefully this will also have an effect on the 3rd Party Test Booking websites that have been such a blight to the booking process to make it fairer to all. Fab to hear this - we have 3 new examiners at my local test centre and it's so refreshing as they are so much more friendly with the candidates than some of the older examiners - this is how it should be! In my opinion, too many examiners have been doing it too long and their attitudes put pupils off! It's an independent driving assessment and shouldn't put the fear of God into candidates - I'm sure some fail as they are scared by the authoritarian attitude they sometimes get! Great news! Maybe the dvsa should try and hold on to the examiners it already has, there has been so many left and still leaving at my local centre. It's time that some examiner's change their attitude and stop thinking that are some type of god, and remember that they are there to do a job. They should also should show a bit of respect to pupils taking test's. I also think that if they don't like the job then leave. Unless they have very thick skins, comments like yours are likely to make all of them want to leave. The vast majority are nice people who are just doing their jobs. Having completed the examiners training the trainers & existing examiners need to be reeducate. They are abrupt- rude & no customer service at all. They need reminding that the candidates are paying to keep them in a job so to make them a nervous candidate is not only appalling behavior it's a power/status & can even be described as bullying as they know there's no way of arguing with them! Here's hoping your plans work. I sure like to be a driving test examiner have tried to access job vacancy on your site it's a night mare go on try it yourself there is no drop down box for this job a lot of big blogs but no action you can email the vacancy for examiners in London to me . A friend of mine went to this assessment at carding ton and was challenged in role play by an actor saying he is fed up with all the l drivers in his street my friend replied with advice that he would put a sign in the test centre to alert instructors and the public re this road and how it's upsetting residents he used this answer because that's exactly how it s dealt with at his local test centre when he got his results back he had failed saying on his report he took no action to deal with the complaint so my question is simple should he of said tough luck old chap the cars have road tax and your road is a public highway what an absolute ridiculous way too recruit future driving examiners. Recently I was given a telling off because I made a comment in the test centre that I DID NOT WANT TO BE IN THE CAR AS AN OBSERVER BECAUSE I MADE A COMMENT TO A PUPIL BEFORE THE START OF THE TEST. It was a simple just think about the question and reply to the show me tell me to calm the pupil down from Afghanistan. I didn't think I had interfered with the driving test. I questioned examiners tone of saying that it sounded an angry tone towards me. It was denied by examiner. After this reprimand I feel now that the DVSA are a law unto themselves my trust in their role is shown as I'm in full control. I've never had this behaviour before after 11 years in this industry and I feel totally disillusioned about how you guys behave. You are quite happy to contact me about this grievance. I have been to nearly 30 test centres in the South East so quite an experienced ADI. I have actually lost my respect to how the DVSA behaves, I've always been supportive of your decisions but however I still see poor behaviour in the outcome of a test lacking. Please sort out your poor performers rather than keep supporting them, if in a real industry you would have your services removed. I'm sure a number of no shows for test are candidates who would give notice within the last 3 working days if they had an incentive. A 50% refund for example would encourage this, more tests available, and DVSA get paid extra for the trouble. A win,win,win surely? Not significant numbers, maybe, but every little helps. I have now been waiting on the merit list for 8 months since being successful in January 2016. I haven't heard anything since. I'm hoping I will be called for a training course soon. Read with interest this article - I have recently undergone the recruitment process and had a provisional job offer at the test centre of my choice only to be let down at the last minute because part-time hours didn't suit their operational needs. I would imagine any hours is better than none at all especially with the current situation. Extremely disappointed after a rigorous and time consuming recruitment process - complete waste of both my time and their resources and time.